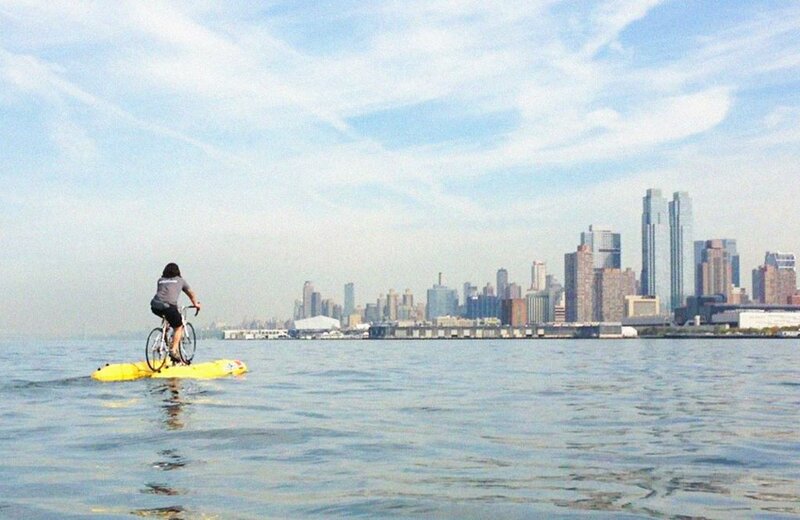 Have you ever wondered how it would be to cycle on water? This however, isn’t an absurd idea at all. The invention of a hydro-cycle had been done long ago. Hydro-cycles are marine based vehicles that resemble a bicycle more than usual marine automation like the submarine. The initial design of a hydro-cycle, created in the late nineteenth century was different from the current design of a shuttle ship which is quite popular. These hydro-cycles move due to the surfboard that exerts buoyancy in water. Shuttle bikes are like a boon for cyclists who do not want to stop moving even if there are water bodies like lakes or rivers in their pathways, which cannot be crossed otherwise. These bikes have a portable shuttle kit that transforms a normal bicycle to a water boat. The kit is extremely handy and can be carried easily. The design of a shuttle bike was the brainchild of Roberto Siviero along with an engineering firm named SBK. The entire kit, along with its parts is exclusively manufactured in Italy and Venice with its canals could be a perfect testing ground. The kit consists of pontoons or floats which are airtight arrangements that are to be inflated with the help of a special bicycle pedal that pumps air into the floats. The pontoons are generally yellow in color and are made of a combination of plastic and nylon, to provide strength and durability. The floats gets sealed automatically when inflated to the electro-mechanism. In order to arrange the aquatic bicycle, one simply needs to attach the rudder to the front wheel for easy movement on the water. There is also a small flexible joint that makes the rudder move smoothly according to the surface (water/shore) without really causing any damage to the boat. The circular gears has a rotational movement, which transfers the power generated with the help of a body roller. Any kind of change in the pedaling speed or the direction of the vehicle can be controlled by these gears. The moment this roller attaches itself to the wheels, the pedaling gets changed into propulsion, helping the vehicle to move forward. The propeller is a fan like structure that generates as well as transfers power by converting the spinning of the wheel into a thrust, thereby pushing the boat with great strength in a particular direction. This handy and essential device has a starting price of around 1300 $. The several advantages of this kit is that it is portable and more affordable than other aquatic vehicles or boats. This can be essentially attached to a bike and used to move on water. In the present world, necessity is the mother of invention. To move forward and develop further, human beings have to force their brain into hyperdrive that would churn out innovations and inventions that would make the human survival easier. This design might seem quirky, or similar to a child’s toy initially, but on closer inspection, we can see that it does seem to have a lot of applications. Papers can be delivered, shore to shore, using bike messengers, who would literally travel on water. Also, for people who don’t have the luxury of gondolas, this is a boon. Finally, this invention is not at all cumbersome but can fit in a bag, due to its very nature (the material consisting of nylon and plastic). This invention could very well be the necessity of tomorrow if people believed in its utility more.
? Watch As This 106 Year Old Man Zip Lines His Way Into Breaking A Guinness World Record Billionaire Gives Away His Fortune To Help Save The Ocean ?